I am pleased to announce that Soul Shaker received its 10th vote today and enabled its current average score of 9.47 to help it become listed in the Top Modules for NWN. It is currently listed as #11, and considering how different it is to the standard game that people might be expecting, I am very pleased with how well it has been received. It is a really great feeling to now have two projects recognised in this way. As I may have mentioned before, my Readable Books is listed as the #1 NWN2 UI interface. 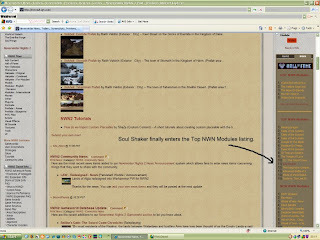 However, considering the amount of work I placed into Soul Shaker, I am glad that it is receiving recognition. The success of these projects does help to encourage me to do more work with the current module. I suppose I will have to take the plunge and buy a new computer soon, or simply try to continue with what I have.